Organizations are leveraging CRM technologies like Microsoft Dynamics and Salesforce as a major part of their digital initiatives to enhance the customer experience, according to the Gartner report. The key to success with those digital initiatives is partnering with an industry expert to guide you. An expert, like Ledgeview Partners. 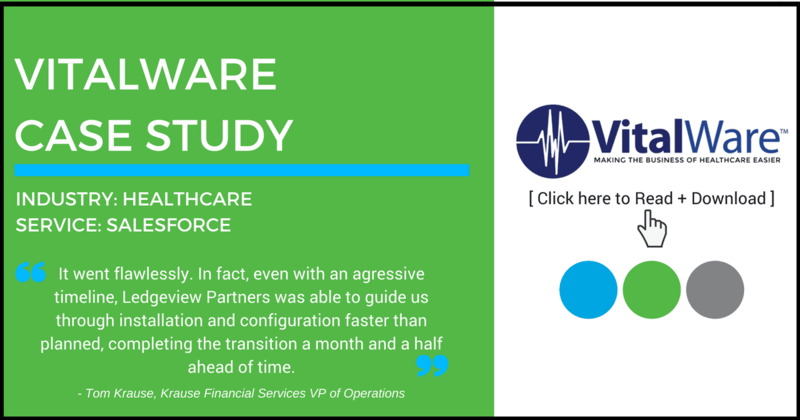 VitalWare LLC, a leading provider of cloud-based technologies that help healthcare providers maintain accuracy and continuity in their documentation, coding and billing data, partners with Salesforce and Ledgeview Partners to increase organizational efficiency, access to customer data, and collaboration across departments. While VitalWare was helping customers solve their challenges, the young company realized it had a few of its own. Chief among them, VitalWare had painfully outgrown its CRM system. They knew they needed a solution that provided a more comprehensive platform for managing customer relationships. They needed a true system that would allow access to data, and more importantly, the ability to analyze that data. >> Read the full customer success story. From personalized, 360-degree patient interactions that keep up with ever-evolving expectations, to connected care workflows across the health ecosystem, to proactive outreach and tools that empower patients to take control of their wellness, Microsoft Dynamics health solutions can help you enable people-centered healthcare. As a result, you can improve patient health and satisfaction, save health professionals’ time, and drive operational efficiency and cost reductions. Watch this video from Microsoft to see how Microsoft Dynamics CRM can help your organization expand EMR capabilities and enhance the overall patient care experience.